We are a local family business based in Jersey in the Channel Islands. The company was established in 1978 by Bob and Shelia Caunce and over the years their three sons have developed there skills in upholstery, blind manufacturing and curtain fitting. 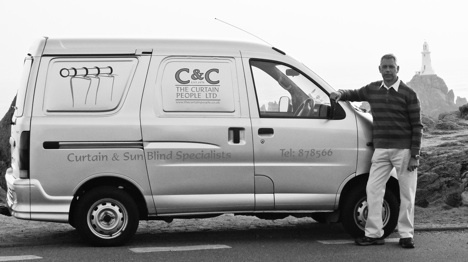 The curtain and blind business is now run by their son Roger and his wife Fran Caunce who have over 27 years experience in the trade. We provide a comprehensive service; making up handmade curtains, valances, pelmets and swags and tales. Most customers require a complete service, from choosing fabric , through to the process of making up curtains and finally the fitting. Tracks & poles and blinds are fitted and curtains are "dressed" and steam pleated to give a final professional look to your window treatment. We are able to remove your curtains and deliver to our dry cleaning agent. We can also reline, rehang and dress your curtains. Together with supplying our own wide range of products, we are able to carry out repairs and maintenance on your existing tracks, blinds and curtains.